Researchers from the investment management firm lay out the data behind their Overwatch League valuations. Blizzard Entertainment’s Overwatch League could bring in more than $100 million in annual base revenue, according to a new report from investment management firm Morgan Stanley. That’s not even the high number: Morgan Stanley’s bull case, a scenario that depends on a confident market, puts revenue at $720 million per year. That number would put Overwatch in the same sphere as the WWE and 20 percent larger than Major League Soccer, Morgan Stanley says. To get there, however, Overwatch League would have to operate with double the amount of teams—32 instead of 16. It would also hinge on higher viewership and monetization, alongside Activison Blizzard’s ability to leverage the Major League Gaming network as an “ESPN” of esports. Should none of this happen and Blizzard struggles with the Overwatch League, Morgan Stanley reports the developer should earn $20 million at minimum. As part of the Overwatch League’s $100 million base valuation, Morgan Stanley suggests that much of the money, $32 million, will come from content licensing and advertising. Another 30 million will be earned through sponsorships, with the remaining 13 percent and 27 percent coming from ticket sales and merchandise, respectively. There are four possible scenarios for the Overwatch League, the firm says. 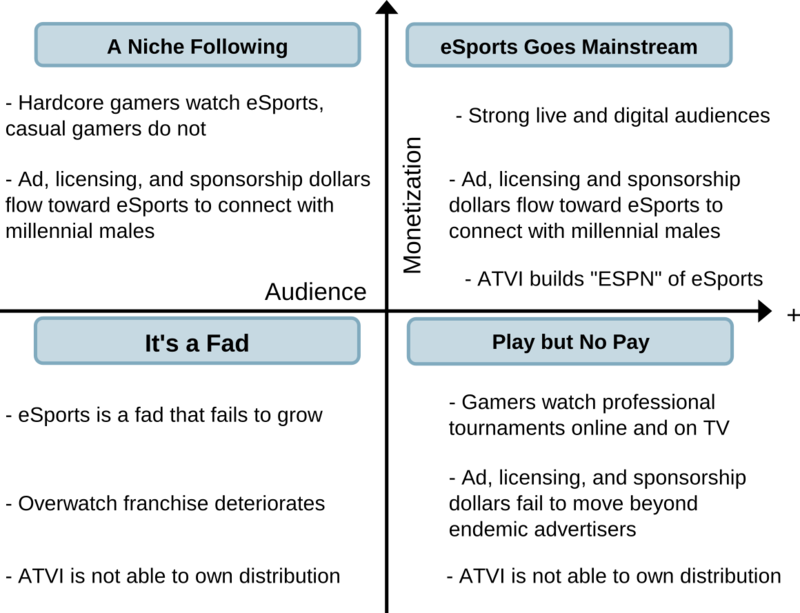 Either it becomes niche, goes mainstream, lives as a fad, or just isn’t profitable. And to have a successful lifespan, Overwatch League needs to see its audience and monetization increase. As the key variables to Overwatch League’s success, both audience and monetization have to be priorities for Blizzard. What can Blizzard do to help Overwatch grow in regards to audience and monetization? Of the 25 million registered Overwatch players, Morgan Stanley estimates that 17 million are active monthly users. That’s far more than the 72,000 average active viewers for the regular season, and 7.7 million viewers for the playoffs, needed to reach Morgan Stanley’s base case for Overwatch. For Morgan Stanley’s bull case, where the $720 million number comes from, Blizzard will have to aim slightly higher—75,000 average viewers for the regular season and 12 million average viewers for the playoffs. Money will follow from there with a substantial audience size, Morgan Stanley says. Overwatch League slots are expected to cost a lot, too—but we’ll only know for sure when the league kicks off around July.